It's hard to believe that the last we checked in with Corinne Bailey Rae she was reeling in emotion for her 2010 sophomore set, The Sea, but now with six years (!) gone by and appearances so far and few between, she has returned to fine form, as she plans to work a new attitude for her upcoming third release, The Heart Speaks In Whispers (out May 13th). Plusher than plush, "Been To Moon" is already a good first look as it's fixated in a soft '70s love groove, this courtesy of KING's Paris Strother, who puts her producing poweress to the test by expertly stringing Corinne's romantic word pearls into a soundbed of guitar strums, dewy synths, and fluttering brass. If this wasn't luxurious enough, a jazzy coda tops the whole affair off, and its so sublime that it will make you swoon. 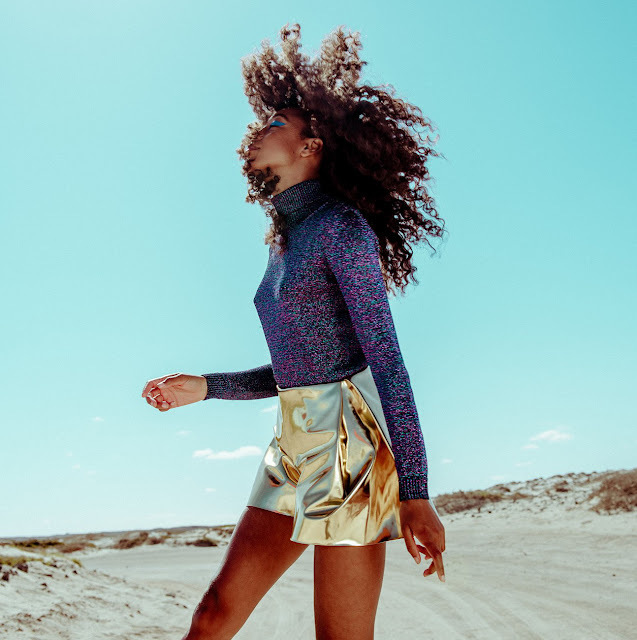 The video courts a similar stylishness as Corinne, acting as a marooned astronaut, makes the volcanic landscapes of Fuerteventra in the Canary Islands her own intergalactic catwalk, as while exploring the "strange, vast planet" she's decked out in retro jumpsuits and space queen-styled gowns, her lush locks flowing carefree. The eye definitely does wander in this wonderfully shot video by British director Favourite Colour: Black (aka Chris Turner), as it also poises Corinne Bailey Rae for a return like no other.